I have often been accused of being too ‘Gun Happy” when it comes to prepping and survival. But I still maintain that unless you can adequately defend yourself, all the prepping in the world just makes you a convenient supply room for someone else and a convenient meal for buzzards. However, there is something that rates right up there with self-protection and that will be your second consideration. Water. Water for survival is so important, and so easily neglected. Many preppers will stock food to the roof, and enough weapons to fight World War Z, and still only have a rudimentary water plan. Many people underestimate the quantities of water they will actually need. I am going to make this a three-part article. Part 1 is going to cover storage. Part 3 is going to cover finding and purifying. 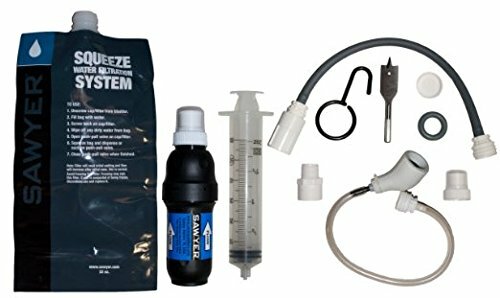 Storing water is going to be a critical issue and should be one of the first consideration for those who are preparing to survive a SHTF situation. Water is essential to life. You can die in as little as three days without it and even sooner if you live in a desert environment like I do. It is critical for digesting the food you need to eat for energy. It is critical for eliminating waste products. It is critical for sanitation to keep you healthy. So how much water should you plan on storing? The general rule of thumb is one gallon per person per day. That is absolute minimum. Try to plan for 2 for bugging in. Consider this a minimum in temperate weather. The amount of water you need to store is going to depend on the number of people you are stocking up for, how long you expect to stock up for, and how much space you can dedicate to water storage. You should also use a variety of storage containers, keeping in mind that if you have to bug out, you need to easily transport some of your water. When you store water, it needs to be in food approved plastic containers. Keep it in a cool dry place, and out of sunlight. Keep your containers off of direct contact with concrete floors, as plastic can leach any chemicals in the concrete. Use wood pallets if possible to keep your containers off the floor. 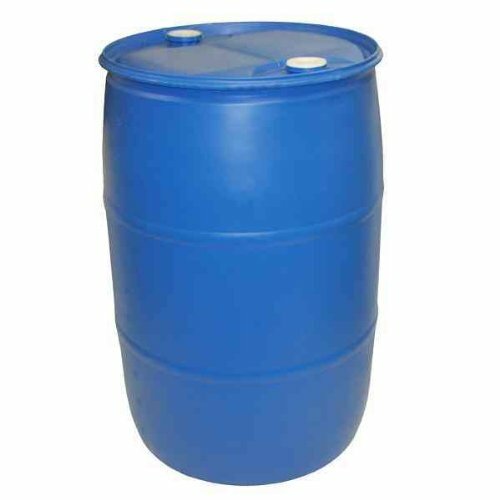 Large containers such as 55gal water barrels offer the ability to store a large quantity in one spot. They can also be used to catch rain water if you live in an area with frequent rainfall. My father-in-law in Germany uses two to store rainwater for his garden, saving money on his water bill, and having a continuous supply of water to keep the family in fresh vegetables year round. Water Bricks are another excellent way to store large quantities of water. 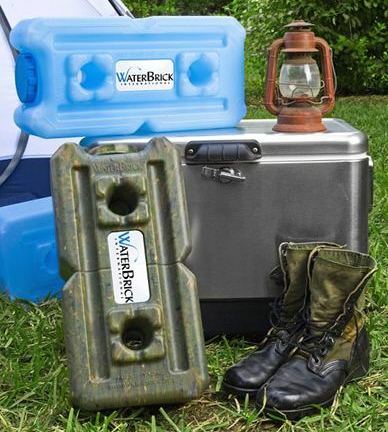 They are stackable, carry 3.5 gallons of water, and can be loaded into your vehicle if you need to bug out. In addition, these units can be used to store other items such as food stuffs or even ammunition in an air tight container. You can also buy water in small bottles by the case, 1 gallon containers, or 2 gallon containers. These have the advantage of being refillable after you use the original water. 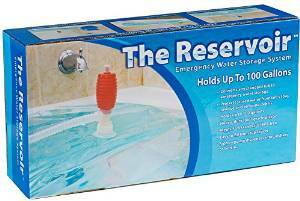 The Reservoir Emergency Water Storage System is a very inexpensive way to store 100 gallons of water in your bathtub. If you have enough warning before a disaster, this can be an excellent way to store emergency water. It keeps the water from being contaminated by the tub residue, and comes with a siphon to fill jugs or bottles. You should never store water in non food rated plastic containers, or those that once held milk, fruit juice or syrup. Cardboard cartons should also be avoided. You should plan on rotating your water every six months. Try to balance your stored water in different size containers, so that you have enough smaller ones to take with you if you have to bug out. Our next article will cover transporting water and carrying it with you. If you liked this article and found it useful, please click the “Vote for Me” icon at the top right of the page. Thanks! I see you’ve posted Water – Part 3 but I don’t see Part 2. Is it just me? Nice article. Looking forward to parts 2 and 3. Thanks. Glad to see the blue barrel. No self respecting US gun trainer is ever without a few of them (LOL). It is fun guessing the right caliber to shoot the hole that the spigot will fit in without leaking. I still havn’t got it right! Every time I watch a US range in action they’ve always got those blue barrels. I’ve always wondered why they do that when I’ve never seen them on the streets. I’ve also wondered what would happen if a trainee was to let rip on a street without the blue barrel to provide cover or rest on. Tell me, do all you US guys swear by them or is it only the 5 minutes of Youtube fame boys that use them? I have shot on a lot of ranges that used simulated barriers for tactical training, but never noticed blue barrels before. At over a $100.00 a pop, I certainly wouldn’t use them. Discarded oil barrels are good. But maybe I’m just frequenting cheap ranges! LOL!